Ratings are averaged based on 24 reviews. Overall had a very good stay. Hotel is big, has great facilities and rooms are beautiful. Fantastic Buffet breakfast however one night we tried the night buffet which was a big mistake - many things not refilled, food added to mismatched signs etc. For families you will love the pools and kids club and the overall quietness. For younger and couples, you might want a little more atmosphere. This is a big chain hotel which was a little sterile for me - lacking in a Bali feel to it - still absolutely beautiful grounds however hotel could really be anywhere - it's generic in that sense. Overall it's a good clean and safe hotel. The Pullman is in a great location. Rooms are comfortable and staff are lovely. Food was average. I had a twin room and they are small single beds that would be my only real criticism. 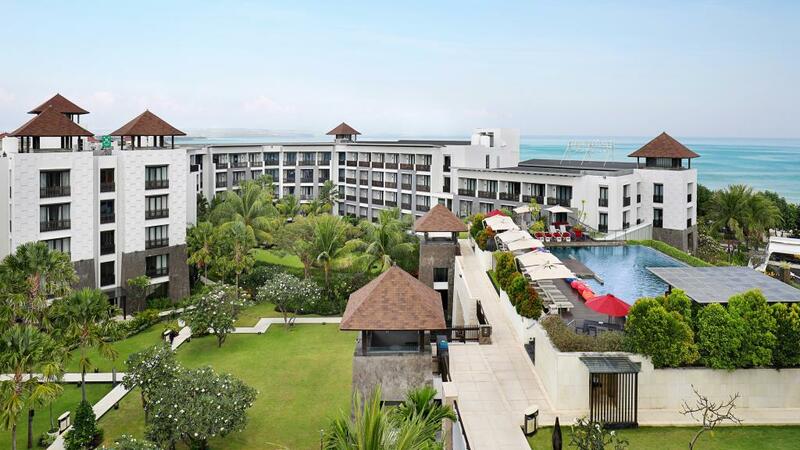 Recently I stayed at the Pullman Legian with my family to celebrate my 40th birthday. Although there were a few staff members at breakfast that were exceptional at making us feel welcome I must say that we were a little underwhelmed with the service and food overall. One evening we had a buffet Italian dinner at the hotel and the food was scarce and average in quality - although we spoke to the manager at the time there was no huge effort to ensure that the food that was empty on the buffet table was replenished. Overall though the location was pretty good and the rooms were clean and nice. The resort from the outside is nice and across from the beach. The room was a bit outdated but had good service. The pool area was good. The kids club wasn't great and the hotel needs to update the kids playground it was a but run down. Overall stay was good walkable to restaurants and beach is across the road. Staff were amazing and very Friendly. Great Hotel in a great location. We had a great time in bali at the pullman. Unfortunately our trip was cut short due to plane travel, but pullman kindly upgraded us to make up for the 2nights we missed. The location was great. Near the beach and everything kuta/seminyak has to offer, without it being at all noisy. We felt very safe in the pullman and the service was fantastic for anything we wanted. The gym is also excellent, more than a token tick box. They had a range of weights and equipment. Also the yoga by the rooftop pool in the morning was an excellent way to start the day. Our only complaint was we didn't like the pillows, really minor compared to all the awesome. Thankyou pullman. We'd totally go back. Do not stay in a grand deluxe room. The standard deluxe rooms are much better..great even.....better lay out and much bigger bathrooms. We changed within first hour of arriving. Breakfast also very average..better on the street. Great location and service. Lovely hotel with friendly staff, gorgeous gardens, clean and spacious rooms and well located in Legian. Enjoyed being able to walk to Kuta without catching taxis and walking across the road to beach foe a swim. Easy access to affordable restaurants and shopping. Day spa lovely but needs maintenance with broken equipment i hydro pool, no hot water in shower on our visit. Great place to stay, good location and great service. It was a nice clean place staff where extremely helpful and friendly. Breakfast buffet was amazing every day could not fault it..would stay again. Food and staff at the hotel was so good. Service impeccable and facilites fantastic. Highly receommend staying there. Amazing hotel, staff were sensational, never a drama. Pullman great location in Legian with excellent dinning options and shopping around. Perfect for everybody, families and couples young and old. I loved every moment of my staff at the Pullman. The staff were so friendly and nothing was an issue. The breakfast was amazing, it was like walking into a supermarket. The room was beautiful- I didn't want to leave. will definitely stay there again. The staff and facilities at this hotel are fantastic, From our arrival to departure, the food was great.the staff always helpful.Will be back again. Thanks to the management and staff for a great holiday. We loved this resort for our final few nights in Bali. The location was perfect only a few steps from Legian Beach and many delicious well priced dining options and shopping. The breakfast was full of variety and lots of options to choose from. The roof top infinity pool at sunset is a must fantastic views and a great relaxed vibe. Everything about The Pullman Bali Legian was just wonderful. Would love to stay here in the future.